MGF Roofing is a specialised Rope Access Roofers in Edinburgh. We are one of the leading roofing contractors across Scotland with only a handful of roofing firms that offer high-level Rope Access roofing services. All our roofers are Rope access trained to IRATA Standards. Why is there a need for rope access roofers? Rope Access is used for accessing buildings and high level areas at a fraction of the cost of traditional access methods. Due to the ability to quickly access difficult to reach areas to carry out remedial roof repairs on buildings in a timely and efficient manner, this can vastly affect the cost of any remedial works. Our rope access roofers can access areas within a few hours and prevent any further damage as a result of continued ingress. How much is a rope access roof repair? Our rope access roofers can carry out small remedial roof repairs in a fairly short time scale. Rope access roof repairs can start from as little as £200. What Roofing services can be carried out using rope access? Any small or medium level of repairs can be carried out using rope access. We also offer roof inspection services both physical and with the assistance of UAV. Gutter cleaning and repairs, Lead work, pointing, vegetation removal, slate repairs, cement works this is by no means an exhaustive list. please contact us for further information. Our rope access roof repair and maintenance services are significantly cheaper than scaffolding and often we find that it is a quicker way to assess your roofing addition to our UAV services. 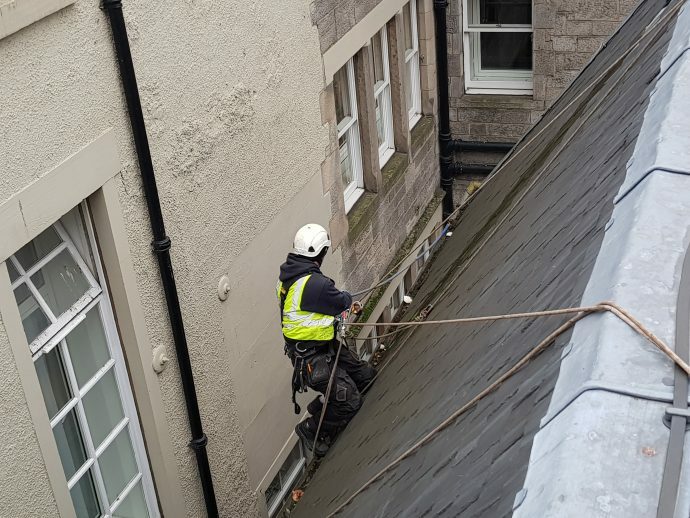 Our rope access roofers Edinburgh experts offer a quicker way of repairing and surveying hard to reach roof systems. If it’s not practical to erect scaffolding, we have experts at MGF Roofers Edinburgh who can guide you through our roofing services free of charge for all of our roofing services, and this includes rope access. If you are interested in rope access roofing services then please visit our rope access page or contact a member of the team today and we will be happy to help. This is an incredibly skilled job – to be an excellent roofer and essentially an abseiler over Edinburgh’s wonderful architecture – wow! Getting a roof right is complicated enough without being suspended from ropes while you’re working on it. I’m glad there’s this alternative to scaffolding – it’s far less invasive, and with the specialist training, it’s perfectly safe for a responsible roofer. Excellent work!